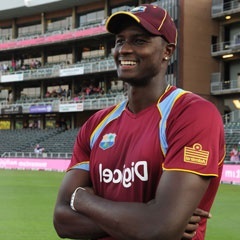 Manchester - West Indies captain Jason Holder won the toss and elected to bat in the delayed day/night first one-day international against at Old Trafford on Tuesday. A wet outfield had delayed the scheduled start by two hours and led to a reduced 42 overs per side match, rather than the standard 50, that was now set to get under way at 2:30pm local time (1330 GMT). Two bowlers could now bowl a maximum of nine overs and the rest up to eight apiece. England had already confirmed that Jonny Bairstow would continue to open in place of the dropped Jason Roy while this fixture marked the first ODI for big-hitting West Indies opener Chris Gayle since the 2015 World Cup following a contract dispute with Caribbean cricket chiefs. This is England's first ODI match since their eight-wicket Champions Trophy semi-final defeat by eventual tournament winners Pakistan in Cardiff on June. It's also the first of a five-match series and West Indies need to win 5-0 or 4-0 with a tie or no-result if they are to qualify directly for the 2019 World Cup in England. A failure to do so would mean West Indies, the 1975 and 1979 World Cup champions, would have to enter a qualifying tournament instead. But the odds are stacked against West Indies, who did not feature in the Champions Trophy because they were not ranked among the world's top eight ODI sides, as they have lost 12 of their last 13 completed matches against England at this level. World Twenty20 champions West Indies, however, did beat England by 21 runs in the lone Twenty20 of this tour in Durham on Saturday -- a repeat of their World Twenty20 final win against England in Kolkata last year -- with Gayle making a blistering 40.